Senior pets have health care needs that differ from younger animals. If your large dog is 6 years old or older, your cat or small dog is 8 years or older, your pet should be seen more regularly than a younger pet would. 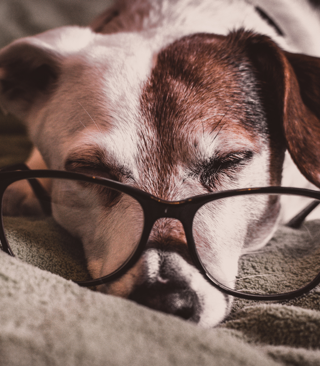 If you notice an increase in water consumption and/or urination, or your pet begins to leak urine while resting, you should schedule a veterinary examination. Senior cats need weight checks every 3 months, and full physical exams every 6 months, and senior bloodwork every 6-12 months. Senior dogs should be examined every 6 months and bloodwork should be evaluated at that time. Any lumps or bumps you may notice should be discussed. Also, mention any odd behaviors or any weight changes you have noticed. Regular dental care is very important, regardless of the age or species. Some younger animals will develop dental disease by their first year of age, although many pets may not develop dental disease until later in life. Regular oral examinations for signs of dental disease will prevent the prolonged, painful symptoms that may cause pets to refuse food, or become ill. Proper dental care includes prophylactic dental cleanings, which are performed under general anesthesia. The ongoing infection caused by dental tartar and gingivitis can enter the bloodstream and damage the heart, kidneys, and liver. Arthritis is another common disease associated with aging pets. There are several safe options for pain management and pain control. A simple blood test can determine if your pet is healthy enough for prescription pain medicine. In many cases, the addition of glucosamine in conjunction with a prescription pain medication yields the best pain relieving results.